Special Edition HKS Carbon Titanium Hi-Power Exhaust system are exclusively available for certain popular applications. 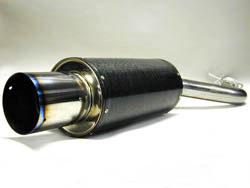 These exclusive versions of the Hi-Power Exhaust consist of a carbon fiber wrapped muffler shell, a 120mm titanium tip, and polished stainless steel piping. Note: Does not clear on vehicles with optional Subaru skid-plate (rear differential). Want this item shipped out today, April 22? Order within the next 5 hrs 16 mins. exudes pure Japanese POWER! nice deep sound that doesn't drown out your engine.